25,000 points Earn 25,000 enrollment FlexPoints worth $375 on airfare, hotel stays, car rentals and more. Just spend $2,000 in eligible Net Purchases on your card within the first four months of account opening. 2X Earn 2X FlexPoints in the category where you spend the most each month–gas stations, office supply stores or airlines, plus on cellular providers. Earn 25,000 enrollment FlexPoints worth $375 on airfare, hotel stays, car rentals and more. Just spend $2,000 in eligible Net Purchases on your card within the first four months of account opening. Earn 2X FlexPoints in the category where you spend the most each month–gas stations, office supply stores or airlines, plus on cellular providers. Earn 1 point for every other eligible net dollar spent. 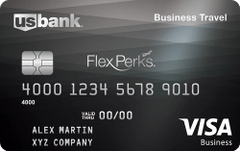 Our take: The U.S. Bank FlexPerks Business Travel Rewards Card is a decent option for frequent travelers – but its earning rate and redemption value are not the best you can find.